Allelopathy is defined as the direct influence from a chemical released from one plant on the development and growth of another. It is known that allelopathic substances are induced by environmental stresses, as shown in Figure 1. Allelopathic compounds may be released into the environment from plants by means of root exudation, leaching, volatilization and decomposition of plant residues in the soil (Figure 1). Allelopathic substances, if present in crop varieties, may reduce the need for weed management, particularly herbicide use. Allelopathy alone may not be a perfect weed management technology but it may be a supplementary tool for weed control. It is extremely difficult to demonstrate allelopathy in nature because of the complexity of plant interference which includes positive, negative and neutral effects on each other (Christensen, 1993). Interference is a combination of the processes of competition for resources and production of allelopathic compounds which suppress competitors (Duke et al. 2001). Thus, allelopathy differs from resource competition. Alleopathy research has been conducted for several decades, but very limited knowledge is still available. An improvement in crop cultivars is the only area that has not been exploited to any great extent as a weed management strategy (Khush, 1996). The possibility of incorporating allelopathic traits into improved rice cultivars, which would reduce the need for applying herbicides to the crop, is worth exploring (Khush, 1996). Of course, thus far, no commercial cultivars carrying allelopathic properties have been developed (Duke et al. 2001). Recently, the allelopathic potential of rice has received a great deal of attention since Dilday et al. (1991) identified rice cultivars exhibiting allelopathic potential against ducksalad [Heteranthera limosa (Sw.) Willd]. In addition, allelopathic potential has been also reported from numerous crops like barley (Lovett and Hoult, 1995); cucumber (Putnam and Duke, 1974); oats (Fay and Duke 1977); rice (Dilday et al. 1998); sorghum (Nimbal et al. 1996); sunflower (Leather, 1983); tobacco (Patrick et al. 1963); and wheat (Wu et al. 1999). Although a breeding approach alone cannot overcome weed problems, an increase in the allelopathic potential of rice varieties will likely have a great impact on both low- and high-input cropping systems. Moreover, allelopathy-based technology is also more easily transferable to farmers in low-input management systems than those in high-input management systems, which entail a heavy use herbicide. There are three excellent reviews on this subject: one is on strategies to enhance weed control by engineered allelochemical production (Duke et al. 2001); the other two reviews are by Olofsdotter (2001a, 2001b) on rice allelopathy. This chapter will briefly discuss the importance of breeding allelopathic crops, focusing on allelopathic traits, methods of measuring genetic difference, the allelochemicals identified, and an introductory method on how to breed allelopathic crops. Rice was used as the model plant, but it would seem that the principles described are applicable to any other crop. Figure 1. Induction of allelochemicals by environmental stresses. A variation in allelopathy among rice cultivars exists. Allelopathy plays a role under field conditions. Allelopathic rice is effective on both mono- and dicot weeds. Identification of rice allelochemicals has progressed remarkably. Quantitative trait loci (QTL) correlated with allelopathy have been determined (Olofsdotter, 2000b). A number of rice cultivars or accessions having allelopathic potential have been determined in different places (Dilday et al. 1991; Fujii, 1992: Kim and Shin, 1998, Olofsdotter et al. 1999). However, no commercial allelopathic rice cultivar has been developed yet. In this regard, the problem now is how to utilize such allelopathic potential in breeding programs. Two very important effects can be expected from the breeding of allelopathic crops. In all rice ecosystems, herbicides have become one of the most important components in weed control. There are two reasons to explain the increased use of herbicides, the first being the widespread adoption of high-yielding varieties which created economic incentives for farmers to reduce weed infestation; and the second is the availability of cheap herbicides, indicating that the cost of weed control by herbicides in wet-seeded rice is less than one-fifth of the cost of a single hand-weeding in Illoilo, Philippines (Moody, 1991). Similar situations exist in West Java, Indonesia and the Mekong Delta, Vietnam (Pandy and Pingali, 1996). Because of the availability of cheap herbicides, it is expected that herbicide usage will continue to increase, both in developed countries, and even in developing countries, where herbicides are currently used sparingly and farm wages are relatively low. However, this does not indicate a lack of importance for hand-weeding. Manual weeding is still the dominant weed control method in many parts of Asia, since management options for weed control are limited under diverse agro-ecological conditions (Kim, 2000). disappearance of some susceptible weeds such as Brasenia schreberi and Sagittaria aginashi, which affects weed biodiversity (Itoh, 2000). Another important element is that rice farming in Asia is closely linked with fish farming and irrigation water used for other purposes. To eliminate molinate and thiobencarb pollution of drinking water, over US$600 000 was expended in cost-share assistance alone to implement water recovery systems in rice production in California (Hill et al. 1977). This was a shock for rice farmers as well as consumers, strongly suggesting an urgent need to monitor herbicide movement and pollution in paddy fields, rivers, all aquatic systems, and even in non-target organisms. All these factors may well provide sufficient reason to attract public concern and anxiety regarding the negative effects of herbicides that might originate from intensive herbicide application in the environment. In this regard, an alternative to such a heavy dependence on herbicide is needed. Such an alternative might be found in the use of allelopathy, which can reduce herbicide use in rice cropping systems. The use of allelopathic crops can definitely reduce the cost of weed control. This technology, (allelopathy), which is seed-based technology is more easily transferable to the low-input management systems prevailing throughout most Asian rice-farming systems. In order to implement this technology, the anticipated problems such as autotoxicity, residual effects of allelopathic cultivars and tolerance of weed population upon repeated cultivation of allelopathic cultivars in the same fields should be thoroughly studied before allelopathic cultivars are released to farmers. The establishment of an appropriate weed-management system could surely help to overcome such negative effects. What are allelopathic traits? Morphological characteristics such as early seedling emergence, seedling vigour, fast growth rates that produce a dense canopy, greater plant height, greater root volume and longer growth duration are known to increase the ability of rice cultivars to compete with weeds (Minotti and Sweet, 1981, Bekowitz, 1988). Plant height is often described as one of the most important factors in the total competitive ability of a crop and accounts for a similar percentage of total competitive ability (Gaudet and Keddy, 1988; Garrity et al. 1992). However, it is not certain that all of these characteristics are also related to allelopathy. How can we measure such allelopathic effects? If there is no specific characteristic, the most visible plant characteristics such as plant height, root length and dry weight of testing plants can be used as measurable parameters to evaluate allelopathic potential. To breed new allelopathic crops, the first requirement is to identify allelopathic accessions or cultivars. To identify allelopathic cultivars, an effective screening method that can test large amounts of accessions in a limited-space in an easy, cheap, reproducible and fast manner must be established. To screen rice allelopathic potential, several methods such as the stairstep method (Bonner, 1950; Liu and Lovett, 1993), hydroponic culture test (Einhelig, 1985), relay-seeding technique (Navarez and Olofsdotter, 1996), agar medium test (Fujii, 1992; Wu et al. 1999), cluster analysis using HPLC (Mattice et al. 2001), water extract method (Kim et al. 1999; Ebana et al. 2001) and 24-well plate bioassay (Rimando et al. 1998) have been suggested. Each of the methods mentioned above can be used as a valuable tool to evaluate allelopathic potential. However, it has also been observed that the screened accessions or cultivars in one method may not be always active in another method employed. In terms of screening, the direct field test might be the best method to evaluate allelopathic potential, but it has many difficulties when dealing with a large number of germplasms. Thus, what is actually needed is a reliable and universal bioassay method that generates a similar trend under different conditions. For this purpose, the continued development of reliable screening systems is needed. Dilday et al. (1998) identified 412 accessions having allelopathic potential against ducksalad [Heteranthera limosa (Sw.) Willd] among 12 000 accessions that originated from 31 different countries. These accessions were genetically very diverse, indicating that allelopathic potential is widely present in rice germplasm. A number of studies have been conducted to evaluate the allelopathic potential from rice germplasm. A large variation in allelopathic potential among rice cultivars has been reported to exist in germplasms. Further, it is assumed that allelopathic potential might be polygenically controlled because it shows a continuous variation in the germplasm. Moreover, allelopathic potential is often attributed to several inhibitors that are assumed to act in an additive or synergistic way rather than in an isolated way (Courtois and Olofsdotter, 1998). Tropical japonica rice varieties have been shown to have a greater allelopathic potential against weeds than other rice, especially Echinochloa spp. (Jensen et al. 2001). Very limited knowledge exists on allelopathy genetics. Moreover, no intentional breeding effort has been made to genetically improve the allelopathic potential of crops, mainly because of our poor knowledge of this phenomenon. In this regard, recent work conducted by Jensen et al. (2001) seems very valuable. Quantitative trait loci (QTL) mapping using 142 DNA markers were located in 142 recombinant inbred lines derived from a cross between cultivar IAC 165 (japonica upland variety), which has strong allelopathic potential and cultivar CO 39 (indica irrigated variety), which has weak allelopathic potential. Three main loci, each accounting for about 10 percent of the upregulation of allelochemical production were localized to rice chromosomes 2 and 3. The two QTL traits on chromosome 3 were closely linked, so they could easily be manipulated. Although QTLs for allelopathic effect against barnyardgrass were identified, it is not presently known what kinds of gene are responsible for the allelopathic effect or the production of allelochemcals. Until recently, many studies verified the mechanisms of a self-defence system, including allelopathy in plants, particularly phenylpropanoid (Figure 2), and isoterpenoid metabolism (Figure 3). Plants respond to environmental stress through a variety of biochemical reactions, which may provide protection against casual agents. The increase of allelopathic phenolic and terpenoid compounds under environmental stresses has been well documented. For example, enhanced UV-B light induces the accumulation of phenylpropanoids and flavonoids in different plant species, such as bean, parsley, potato, tomato, maize, rye, barley and rice (Hahlbrock and Scheel 1989; Ballare et al. 1995; Tevini et al. 1991; Liu et al. 1995; Kim et al. 2000a). Figure. 2. Scheme of phenylpropanoid pathway. All phenylpropanoids are derived from cinnamic acid, which is formed from phenylalanine by the catalytic action of phenylalanine ammonia-lyase (PAL), the branch point enzyme between primary (shikimate pathway) and secondary (phenylpropanoid) metabolism (Figure 2). It is known that many phenolic compounds not only have a physiologically functional ability, but also plant allelopathic potential. Figure 3. Scheme of isoprenoid pathway. There are a number of studies indicating that common putative allelopathic substances found in rice are phenolic compounds (Rice, 1987; Chou et al. 1991; Inderjit, 1996; Mattice et al. 1998; Blum, 1998). Kim et al. (2000b) identified several compounds by GC/MS analysis from Kouketsumochi: potential allelopathic rice, such as sterols, benzaldehydes, benzene derivatives, long-chain fatty acid esters, aldehydes, ketones and amines from fractions with biological activity. Several compounds from Taichung Native 1, allelopathic rice, have been identified by the bioassay-guided isolation method (Rimando et al. 2001). They are azelaic acid, p-coumaric acid, 1H-indole-carboxaldehyde, 1H-indole-3-carboxylic acid, 1H-indole-5-carboxylic acid and 1,2-benzenedicarboxylic acid bis (2-ethylhexyl) ester. Among the allelopathic substances identified, p-coumaric acid, a known allelochemical, inhibited the germination of lettuce (Lactuca sativa L.) seedlings at 1mM, but was active against barnyardgrass only at concentrations higher than 3 mM (Rimando et al. 2001). A similar trend in results was reported by Kim et al. (2001b) in that p-coumaric acid was present in potential allelopathic rice such as Kouketsumochi, Tang Gan and Taichung Native 1. In addition, the content of this acid was markedly increased by UV irradiation (Figure 4). Figure 4. Intermediate compounds in the phenylpropanoid pathway in various cultivars identified by HPLC. The rice leaves were extracted with 10 ml methanol and 20 ul of treated sample was injected into a CLC-ODS column. 4HBA: 4-hydroxybenzoic acid, CAN: cinamic acid, p-CMA: p-coumaric acid, BA: benzoic acid, SA: Salicylic acid. These results strongly suggest that p-coumaric acid may be a compound regulated by environmental stresses and play a role in rice allelopathy. On the contrary, there were different reports that concentration of a single phenolic acid and combinations of all phenolic acids determined in rice ecosystems do not reach phytotoxic levels (Tanaka et al 1990; Olofsdotter et al. 2001). Thus far, it is assumed that no single allelochemical responsible for rice allelopathy has been determined. On the contrary, more than one chemical is likely to be responsible for allelopathy in rice. Thus, the identification of allelochemicals in rice is of utmost importance for use as markers in gene identification and regulation. The three approaches to create more allelopathic crops are the traditional breeding method; the incorporation of allelopathic properties to hybrid rice; and genetic engineering. From the breeding perspective, the distinction between allelopathy and competition is somewhat difficult in a farmers field because interference is the phenomenon that really counts (Courtois and Olofsdotter, 1998). In this regard, the best way might be to breed allelopathic cultivars having high competitiveness. If breeding of allelopathic cultivars is achieved, it can be truly beneficial to farmers in rice-producing countries. If a high number of QTLs with little effect are involved, a traditional breeding method can be a reasonable alternative (Courtois and Olofsdotter, 1998). The principle of traditional breeding for the genetic studies is simple. Two parents with contrasting behaviour are crossed and recombinant inbred lines (RILs) are derived through the single-seed descent (SSD) method. This procedure consists of advancing the F2 without selection for two or three generations (sometime four to five generations) in such a way that each F4 or F5 seed traces back to a different F2 plant. Only one seed is retained from each plant in each generation. This will repeat for two or more generations so that afterwards the plants having desirable characteristics can be selected. Once a reasonable degree of fixation is obtained, the allelopathic potential of the RILs can be evaluated. The seed can then be increased and tested under field conditions for use as allelopathic cultivars. A cross between Donginbyeo (non-allelopathic cultivar, but a high yielding variety with good quality) and Kouketsumochi (an allelopathic cultivar, more similar to a wild type) was made and advanced by the SSD breeding method. We identified the F5 generation of this cross-exhibited allelopathic potential when determined by the water-extract method. The allelopathic potential of the F6 generation is now being tested under field conditions. The SSD method is simpler than the pedigree method. The SSD method has several advantages, including a quick increase of the additive variance among families; the need for only small breeding space and saving of work; and suitability for low heritability traits where visual selection is not effective (Moreno-González and Cubero, 1993). Another method is to cross two parents with contrasting behaviour through the backcrossing method to produce near-isogenic lines (NILs) carrying different genes. The allelopathic potential of the NILs can be determined when a reasonable degree of fixation is obtained. Despite the influence of biotechnology and genetic engineering in changing future production methods for breeding new crop varieties, traditional plant breeding research and breeding methodology will play a significant role in future breeding programmes. Further refinement of these methods and better knowledge of classical knowledge are a prerequisite for the rational use of new tools such as molecular markers. The three-line hybrid rice that is popularly cultivated in China is a good competitor because of its rapid and profuse vegetative growth in comparison with an inbred line. It will be worthwhile if allelopathic traits can be introduced into an elite restorer line in developing three-line hybrid rice. Lin et al. (2000) attempted simultaneous backcrossing and selfing breeding method to develop hybrid rice with allelopathic activity and its counterpart, isogenic hybrid rice with a non-allelopathic effect on weeds. Three lines of rice, Kouketsumochi, Rexmont and IR24 were used as the donors of allelopathy, non-allelopathy and restoring genes, respectively. The back-crossing method was used to develop restorer lines with allelopathic activity and its isogenic line with non-allelopathic genes. The selected restorer lines were crossed with cytoplasm-sterile lines (A line), presently used to test the outcross rate (Figure 5) and also illustrates a scheme on how to develop hybrid rice having allelopathic potential. Allelopathic potential and heterotic performance were analysed in a laboratory and greenhouse using the water-extract method and density-dependent method, respectively (Richardson et al. 1988; Lin et al. 2000). The results indicated that the heterotic effect on allelopathy in rice was positively significant, showing higher heterosis over the mid-parent. In addition, this specific hybrid rice had an additive suppressive effect on the target weed of barnyardgrass, exhibiting a large deviation from the resource competition curve (Lin et al. 2000). This approach seems to be a promising method that can incorporate allelopathic traits to hybrid rice having high yield capacities. Figure 5. Scheme for introducing a favorable allelopathic gene to hybrid rice from the donor Kouketsumochi into recurrent parent IR24, restorer line by simultaneous backcrossing and selfing. Two methods for creating more allelopathc crops have been suggested: (1) the regulation of gene expression related to alleochemical biosynthesis; and (2) the insertion of genes to produce allelochemicals that are not found in the crop (Duke et al. 2001). Much of the presently available information on engineering allelochemicals comes to us through efforts to overproduce valuable secondary metabolites in plants (Canel, 1999). Relating to the molecular approach for weed control, a good reference has recently been published by Gressel (2002). Most secondary metabolites being used as allelochemicals are very complex and a multi-gene system might have to be developed and transformed into the specific crop to produce allelochemicals (Gressel, 2002). This seems to be still hypothetical, but new areas opening up. Various plant species suppress other species by production of allelochemicals, which are not toxic to the originating plant but toxic to other vegetation. It is now known that molecular approaches in breeding allelopathic cultivars are potentially much more complicated than developing a herbicide-resistant crop or producing a crop with resistance to insects or pathogens. In order to regulate gene expression, the first requirement is to identify the target allelochemical(s), to determine enzymes and the genes encoding them, and thus a specific promoter can be inserted to crop plants to enhance allelochemical production. In our recent work, the highest content of p-coumaric acid was found in among intermediates of the phenylpropanoid pathway of several allelopathic rice cultivars used (Figure 4). Cinnamic acid 4-hydroxylase (CA4H) is the enzyme catalyzing cinnamic acid to p-coumaric acid, which is a key reaction in the biosynthesis of a large number of phenolic compounds in higher plants. The activity of CA4H was measured to elucidate how the activity is influenced by UV irradiation in rice leaves. CA4H activity in Kouketsumochi was induced by UV and its peak activity was observed at 24 h after UV irradiation for 20 min. AUS 196 showed no response, however, indicating a differential response to UV or other environmental stresses among rice cultivars. This indicates further that some metabolites having allelopathic potential might be newly synthesized or highly elevated in rice plants by UV irradiation (Kim et al. 2000a). Owing to the increased content of p-coumaric acid in rice plant irradiated by UV, it was assumed that the CA4H gene plays a role in the elevation of the allelopathic function in rice plants. Further study was conducted to investigate a specific promoter that confers responsiveness on environmental stresses and plant-plant interaction. If a promoter is specifically responsive to an elicitor, it can be used to regulate genes to code allelopathic potential. We examined the expression of GUS activity of tobacco plants transformed with the constructs of various CASC (Capsicum annuum sesqiterpene cyclase) promoters fused into GUS gene in order to determine the effective motifs response to UV light. Back et al. (1998) reported that UV plays a role in the expression of defence-related genes and biosynthesis of phytoalexins in pepper. To determine whether the CASC promoters are inducible by UV irradiation or not, we examined GUS activity of the transgenic plants. Transgenic plants were UV irradiated for 15 min using a Hitachi germicidal lamp (15W) at a distance of 20 cm. The irradiated leaves were placed on a MS medium for 24 h and were used for the activity measurement. The levels of GUS activity for transgenic plants with pBI121-KF1 and pBI121-KF6 were significantly elevated by UV-irradiation and had a two-to-threefold increase approximately over the untreated-transgenic plants. In contrast, GUS expression in the transgenic plants with pBI121-CaMV 35S was not changed by UV, and in the other constructs had only a very small increase (Shin et al. 2000). This result suggests that the CASC promoters of KF-1 and KF-6 may contain cis-acting elements capable of conferring quantitative expression patterns that are exclusively associated with UV irradiation. The regulation of genes associated with allelopathy can be achieved by developing a specific promoter responsive to plant-weed competition or environmental stresses. The CASC promoters of KF-1 and KF-6 obtained may be specific to UV. Thus, this promoter can be used for the overexpression of specific promoters constructed to allelochemical-producing genes (Shin et al.). To regulate the CA4H gene in the phenylpropanoid pathway, specific promoters, the CASC-KF1 and KF6 were fused to CA4H gene. The gene constructs were introduced into the binary plant expression vector pIG121-HMR with reverse primer harbouring BamHI site and forward primer harbouring HindIII site (Figure 6). We are at present investigating the regulatory effects on gene coding for allelochemical-producing enzymes. Figure 6. 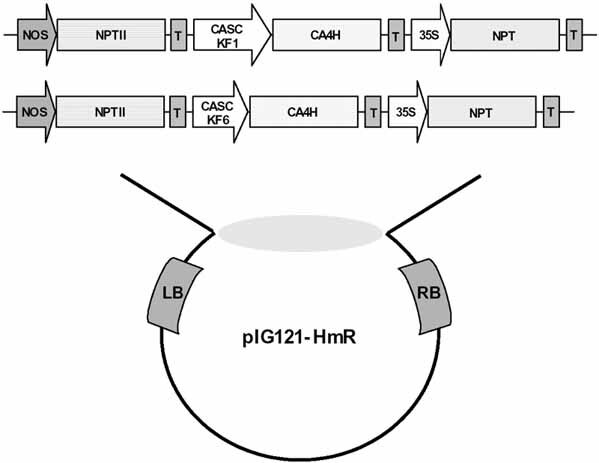 The gene cassette with specific promoters responsive to UV irradiation in pIG121-HmR. This approach employs altering existing biochemical pathways by the insertion of transgenes to produce new allelochemicals. It seems to be a difficult approach to employ, but it remains one of the promising molecular approaches to be advanced in the near future. In this regard, there was a good review conducted by Duke et al. (2001) and a reference book on molecular biology of weed control very recently published by Gressel, (2002). An improvement in allelopathic potential in crop varieties will have a great impact on both low-input and high-input management systems. Allelopathy alone is not likely to replace totally other weed control practices because its effectiveness is influenced by many factors. However, marginally reduced use of herbicide over time will be a significant economical benefit to farmers and will also reduce the ecological impact on the environment. At present, no commercial cultivars carrying allelopathic properties are available, but there is the possibility of breeding new allelopathic crops by regulating their capacity to produce allelopathic substances. In association with the development of breeding new allelopathic crop cultivars, much progress has been made in screening methods, identification of specific allelochemicals and related genes that can be applicable in breeding programmes. If allelochemicals or genes responsible for allelopathic effects are identified, allelopathic traits can be easily incorporated into improved cultivars through breeding techniques available at the present time. Of course, in order for this technology to be practically used in rice production systems, potential problems such as autotoxicity, metabolic imbalance, residual effect and the development of a tolerant population on repeated cultures of such cultivars should be thoroughly solved before allelopathic cultivars are released. Nevertheless, it is assumed that the breeding of new allelopathic crop cultivars will represent an attractive alternative in meeting the demands of consumers and environmentalists. A multidisciplinary team approach among a wide range of scientists, including weed scientists, ecologists, natural-product chemists, plant breeders and molecular biologists, could help to achieve the goal of breeding allelopathic crop cultivars. Further studies on the identification of specific allelochemicals and genes responsible for allelopathy will shed more light on breeding allelopathic crop cultivars. Back, K., He, S., Kim, K.U. & Shin, D.H. 1998. Cloning and bacterial expression of sesquiterpene cyclase, a key branch point enzyme for the synthesis of sesquiterpenoid phytoalexin capsidiol in UV-challenged leaves of Capsicum annuum. Plant Cell Physiol. 39 (9): 899-904. Ballare, C.L., Barnes, P.W. & Flint, S.D. 1995. Inhibition of hypocotyls elongation by ultraviolet-B radiation in de-etiolating tomato seedlings. I. The photoreceptor. Physiol. Plant 93: 584-592. Banthorpe, D.V. 1991. Terpenoids classification of terpenoids and general procedures for their characterization. In Terpenoids of Methods in Plant Biochemistry Vol. 7. Academic Press, London. pp. 1-41. Berkowitz, A.R. 1988. Competition for resources in weed-crop mixtures. In Altiera, M.A. and Liebman, M. eds. Weed management in agrosystems: ecological approaches. Boca Raton, Florida, CRC Press. pp. 89-119. Blum, U. 1998. Effect of microbial utilization of phenolic acid and their phenolic acid breakdown products on allelopathic interactions. J. Chem. Ecol. 24: 685-708. Bonner, J. 1950. The role of toxic substances in the interactions of higher plants. The Botanical Review 16: 51-65. Canel, C. 1999. From genes to phytochemicals: the genomics approach to the characterization and utilization of plant secondary metabolism. Acta Hortic. 500: 51-57. Chou, C.H., Chang, F.J. & Oka, H.I. 1991. Allelopathic potential of wild rice Oryza perennis. Taiwania 36 (3) 201-210. Courtois, B. & Olofsdotter, M. 1998. Incorporating the allelopathy trait in upland rice breeding programs. In Olofsdotter, M. ed. Allelopathy in Rice. Manila, Philippines: Int. Rice Research Institute. pp. 57-68. Dilday, R.H., Nastasi, P., Lin, J. & Smith, R.J., Jr. 1991. Allelopathic activity in rice (Oryza sativa L.) against ducksalad (Heteranthera limosa (sw.) Willd.). In D. Hanson, M.J. Shaffer. D.A. Ball. and C.V. Cole., eds. Symposium Proc. on Sustainable Agriculture for the Great Plains. USDA, ARS-89. pp. 193-201. Dilday, R. H., Yan, W.G., Moldenhauer, K.A.K. & Gravois, K.A. 1998. Allelopathic activity in rice for controlling major aquatic weeds. In Olofsdotter, M., ed. Allelopathy in Rice. Manila, Philippines: Int. Rice Research Institute. pp. 7-26. Duke, S.O., Scheffler, B.E., Dayan, F.E., Weston, L.A. & Ota, E. 2001. Strategies for using transgenes to produce allelopathic crops. Weed Tech.15: 826-834. Ebana, K., Yan, W., Dilday, R.H., Namai, H. & Okuno, K. 2001. Variation in the allelopathic effect of rice with water soluble extracts. Agronomy J. 93: 12-16. Einhehelig, F.A., Leather, G.R. & Hobbs, L. 1985. Use of Lemma minor L. as a bioassay in allelopathy. J. Chemical Ecology 11(1): 65-72. Fay, P.K. & Duke, W.B. 1977. An assessment of allelopathic potential in Avena germplasm. Weed Sci. 25: 224-228. Fujii, Y. 1992. The potential biological control of paddy weeds with allelopathy: allelopathic effect of some rice varieties. In Proc. Int. Symposium on Biological Control and Integrated Management of Paddy and Aquatic Weeds in Asia. Tsukuba, Japan. National Agricultural Research Center. pp. 305-320. Garrity, D.P., Movillon, M. & Moody, K. 1992. Differential weed suppression ability in upland rice cultivars. Agon. J. 84: 586-591. Gaudet, C.L. & Keddy, P.A. 1988. A comparative approach to predicting competitive ability from plant traits. Nature 334: 242-243. Gershenzon, J. & Croteau, R. 1993. Terpenoid biosynthesis: the basic pathway and formation of monoterpenes, sesquiterpenes, and diterpenes. In T.S. Moore., ed. Lipid Metabolism in Plants. CRC Press, Boca Raton, Florida, USA. pp. 340-388. Gressel, J. 2002. Molecular Biology of Weed Control. Taylor and Francis Publishers, London. Hahlbrock, K. and D. Scheel 1989. Physiology and molecular biology of phenylpropanoid metabolism. Ann. Rev. Plant Physiol. Plant Mol. Biol. 40: 347-369. Hill, J.E., Roberts, S.R., Scardaci, S.C. & Williams, J.F. 1997. Rice herbicides and water quality. A Califonia success story in government and industrial coordination. Proc. of 16th Asian Pacific Weed Society Conference (Kuala Lumpur, Malaysia).Asian-Pacific Weed Science Society, Kuala Lumpur, pp. 388-392. Inderjit. 1996. 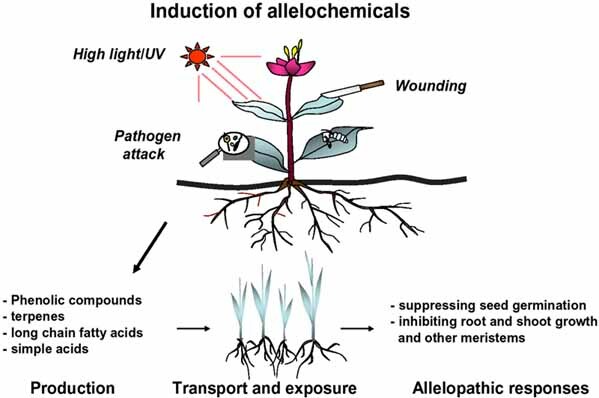 Plant phenolics in allelopathy. Bot. Rev. 62: 186-202. Itoh K. 2000. Importance of biodiversity of aquatic plants in agro-ecosystem for rice production. In Abstracts of the Int. Symposium on Weed Biodiversity (National Sun Yat-sen University, Kaohsiung, Taiwan, 28-30 November, 2000). Weed Science Society of the Republic of China and National Sun Yat-sen University, Kaoshing, p. 10. Jensen, L.B., Courtois, B., Shen, L., Li, Z., Olofsdotter, M. & Mauleon, R.P. 2001 Location genes controlling rice allelopathic effects against barnyardgrass in upland rice. Agron. J. 93: 21-26. Khush, G.S. 1966. Genetic improvement of rice for weed management. In Naylor, R., ed. Herbicides in Asian rice: transitions in weed management. Palo Alto (California):Institute for Int. Studies, Stanford University, and Manila (Philippines): Int. Rice Research Institute. pp. 201-207. Kim, K.U. & Shin, D.H. 1998. Rice allelopathy research in Korea. In M. Olofsdotter, ed. Proc. of the Workshop on Allelopathy in Rice, 25-27 November 1996. Manila (Philippines): Int. Rice Research Institute. pp. 39-44. Kim, K.U., Shin, D.H., Kim, H.Y., Lee, I.J. & Olofsdotter, M. 1999. Evaluation of allelopathic potential in rice germplasm. Korean J. of Weed Sci.9 (2): 1-9. Kim, K. U. 2000. Weed management implication and trends of direct seeding in Asia. Third Int. Weed Science Congress (Foz do Iguassu, Brazil, 6-11 June 2000). Int. Weed Science Society, Corvallis, Manuscript no. 508, pp. 1-10. Kim, H.Y., Shin, H.Y., Sohn, D.S., Lee, I.J., Kim, K.U., Lee, S.C., Jeong, H.J. & Cho, M.S. 2000a. Enzyme activities and compounds related to self-defense in UV-challenged leaves of rice. Korean J. Crop Sci. 46 (1): 22-28. Kim, K.W., Kim, K.U., Shin, D.H., Lee, I.J., Kim, H.Y., Koh, J.C. & Nam, S.H. 2000b. Searching for allelochemicals from the allelopathic rice cultivar, Kouketsumochi. Korean J. of Weed Sci. 20 (3): 197-207. Leather, G.R. 1983. Sunflowers (Helianthus annuus) are allelopathic to weeds. Weed Sci. 31: 37-42. Lin, W., Kim, K.U., Liang, K. & Guo, Y. 2000. Hybrid rice with allelopathy, In K.U. Kim and Shin, D.H. eds. Rice Allelopathy. Proc. of the Int. Workshop in Rice Allelopathy (Kyungpook National University, Taegu, Korea, 17-19 August 2000). Institute of Agricultural Science and Technology, Kyungpook National University, Taegu, pp. 49-56. Liu, D.L. & Lovett, J.V. 1993. Biologically active secondary metabolites of barley. 1. Developing techniques and accessing allelopathy in barley. J.of Chemical Ecology 19 (10): 2217-2230. Liu, L., Gitz, D.C. & McClure, M.W. 1995. Effect of UV-B on flavonoids, ferulic acid, growth and photosynthesis in barley primary leaves. Physiol. Plant 93: 725-733. Lovett, J.V. & Hoult, A.H.C. 1995. Allelopathy and self-defense in barley. Am. Chem. Soc. Symp. Ser. 582: 170-183. Mattice, J.D., Lavy, T., Skulman, B.W. & Dilday, R.H. 1998. Searching for allelochemicals in rice that control ducksalad. In M. Olofsdotter., ed. Allelopathy in rice. Proc. Workshop on Allelopathy in Rice. Manila, Philippines, 25-27 Nov. 1996. IRRI, Manila, Philippines. pp. 81-98. Mattice, J.D., Dilday, R.H., Gbur, E.E. & Skulman, B.W. 2001. Barnyardgrass growth inhibition with rice using high-performance liquid chromathography to identify rice accession activity. Agron. J. 93: 8-11. Minotti, P.L. & Sweet, R.D. 1981. Role of crop competition in limiting losses from weeds. In D. Pimental ed. Handbook of pest management in agriculture. Vol. II. Boca Raton Florida, USA. CRC Press. pp. 351-367. Moody, K. 1991. Weed management in rice. In Handbook of Pest Management in Agriculture 2nd edition. Pimenteal, D. ed. CRC Press Boca Raton, Florida, USA. pp. 301-328. Moreno-Conzales, J. & Cubero, J.I. 1993. Selection strategies and choice of breeding methods. In Hayward, M.D., ed. Plant Breeding. Chapman and Hall, pp. 296-297. Navarez, D. & Olofsdotter, M. 1996. Relay seeding procedure as screening method in allelopathy research. Proc. 2nd Int. Weed Control Conf. 4: 285-1290. Nimbal, C.I., Yerkes, C.N., Weston, L.A. & Weller, S.C. 1996. Herbicidal activity and site of action of the natural product sorgoleone. Pestic. Biochem. Physiol. 54: 73-83. Olofsdotter, M. 2001a. Getting closer to breeding for competitive ability and the role of allelopathy-an example from rice (Oryza sativa). Weed Tech. 15: 798-806. Olofsdotter, M. 2001b. Rice - A step toward use of allelopathy. Agron. J. 93: 3-8. Olofsdotter, M., Rebulanan, M., Madrid, A., Dali, W., Navarez, D. & Olk, D.C. 2001. Why phenolic acids are unlikely allelochemicals in rice. J. Chem. Ecol. (in press). Pandy, S. & Pingali, P.I. 1996. Economic aspects of weed management. In Auld, B.A. & Kim, K.U. eds. Weed Management in Rice. FAO, Plant Production and Protection Paper 139. Food and Agriculture Organization of the United States, Rome. pp.55-73. Patrick, A.Q., Toussoun, T.A. & Snyder, A. 1963. Phytotoxic substances in arable soils associated with decomposition of plant residues. Phytopathology 53: 152-161. Putnam, A.R. & Duke, W.B. 1974. Biological suppression of weeds: Evidence for allelopathy in accessions of cucumber. Science 185: 370-372. Richardson, D.R. & William, G.B. 1988. Allelopathic effects of shrubs of the sand pine scrub on pines and grasses of the sandhills. Forest Science 34: 592-605. Rice, E.L. 1987. Allelopathy: An overview. Allelochemical: Role in agriculture in forestry. In American Chemical Society Symposium Series No. 330. pp. 8-22. Rimando A.M., Dayan, F.E., Czarnota, M.A. Weston, L.A. & Duke, S.O. 1998. A new photosystem. II. Electron transfer inhibitor from Sorghum bicolor. J. Nat. Prod. 61: 927-930. Rimando, A.M., Olofsdotter, M., Dayan, F.E. & Duke, S.O. 2001. Searching for rice allelochemicals: an example of bioassay-guided isolation. Agron. J. 93: 16-20. Shin, D.H.,. Kim, K.U., Sohn, D.S., Kang, S.U., Kim, H.Y., Lee, I.J. & Kim, M.Y. 2000. Regulation of gene expression related to allelopathy. In Kim, K.U. & Shin, D.H., eds. Proc. of the Int. Workshop in Rice Allelopathy (Kyungpook National University, Taegu, Korea, 17-19 August 2000). Institute of Agricultural Science and Technology, Kyungpook National University, Taegu, pp. 109-124. Tanaka, F., Ono, S. & Hayasaka, T. 1990. Identification and evaluation of toxicity of rice root elongation inhibitors in flooded soil with added wheat straw. Soil Sci. Plant Nutr. 36: 97-103. Tevini, M., Braun, J. & Fieser, G. 1991. The protective function of epidermal layer of rye seedlings against ultraviolet-B radiation. Photochem. and Photobiol. 53: 329-333. Valverde, B.E., Riches, C.R. & Caseley, J.C. 2000. Prevention and management of herbicide resistant weeds in rice. Published by Grafos, S.A., Cartago, Costa Rica. pp. 25-30. Wu, H., Pratley, H., Lemerle, D. & Haig, T. 1999. Crop cultivars with allelopathic capability. Weed Res. 39: 171-180.